This song sung by Russian Princess Anastasia charms everybody by its lyrics and rhythms at once. And the story that happened so long ago still seduces the people’s minds and makes think whether Princess Anya (as she was called by her relatives) was really killed or managed to escape. Of course, we are left just to guess. 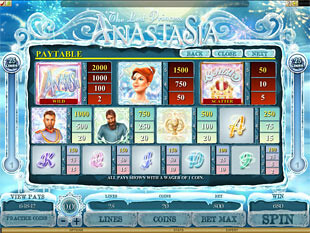 However, Microgaming decided to refresh this mystical story in our memory and released a new 5 reel slot called ‘The Lost Princess Anastasia’ with 25 paylines. Interesting to see the main heroes and penetrate into the atmosphere of those times? Then launch a no download variant of the slots. Reveal the Lost Princess Anastasia’s secret by yourself. 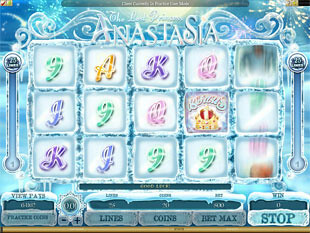 Can see Anastasia name frosted at the reel? It’s a great luck as you’ve got a Wild symbol. Wilds can substitute any symbols apart from Scatters in the game. 5 Anastasia names appeared at one go? Then get the biggest jackpot of $4,000 and think what you can spend this sum on. Scatter symbol is an image of the Royal Crown. Collect 3 or more these symbols at the reels and activate 5 Free Spins. Retrigger the bonus game and get additional 5 Free Spins once again. This symbol is really marvellous as it offers a special reward of $2,500 hitting all 5 Scatters at once. We think it’s really worth trying to get. Before looking at the top jackpots, it’s better to examine coins’ and bets’ details first. So, choose the coins valuing from $0.01 to $0.10 and the number of coins per line on the basis of 20 coins as the maximum. Bets vary from 25 to 500 coins possible to stake. You’re enabled to win the most secret jackpot of 2,000 coins or $4,000 gaining 5 Wild symbols. Just one spin can separate you from the pretty good money. So don’t miss a second to catch it right now! Stop feature is one more dedicated assistant for you in the slots game. Just click the ‘Stop’ button during the spinning and make the reels stop any second you like. Anastasia suggests you getting Free Spins doing almost nothing. What can cost you to hit 3 or more Scatter symbols? Because it is rather easy. However, you’ll grasp 5 Free Spins in return. What can be more pleasant? Moreover, after each Free Spin, random Wilds appear and choose any game symbol to change it into the Wild. Also there is a chance for you to obtain additional 5 Free Spins in case of the game retriggering. Playing The Lost Princess Anastasia Slot Machine, find yourself into the old times of Russia when the reins of government were in Tzar’s hands. Meet the mysterious Princess Anastasia presenting you a lot of legends. Of course, try to read Nastya’s riddle and ask her for luck to win up to $4,000.